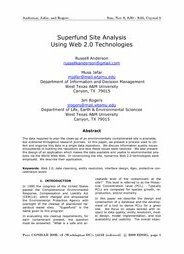 The data required to plan the clean-up of an environmentally contaminated site is available, but scattered throughout research journals. In this paper, we present a process used to collect and organize this data in a single data repository. We discuss information quality issues encountered in building the repository and how these issues were resolved. We also present the design of an application which makes the data available and usable to environmental analysts via the World Wide Web. In constructing the site, numerous Web 2.0 technologies were employed. We describe their application.